US Aims to stop Chinese Arms from reaching Zimbabwe... Finally! The Presidental Results have yet to be released. Some indications are that they will be released on the weekend of April 26. Other reports that Zimbabwe may have a "Government of National Unity". So why would the Zimbabwe Military Leadership order a huge shipment of Chinese Weapons on April 1? And why has the US joined the Massive Effort to stop it? First of all let me state that the Idea of China selling weapons to Zimbabwe is not a Major issue. Most Advocates are concerned about the timing of the deal. According to some sources the order was placed on April 1,2008. This was approximately 96 hours after the polls CLOSED!!!!! Now after boycotts and legal Action the An Yue Jiang which is of Chinese Registry left Durban on Friday Night. It is believed to be heading towards Angola which has been an ally of President Mugabe. We don't know for certain where it is heading as the ship has turned of its Transponder in effect making the Ship Blind. Above you see the An Yue Jiang. This is the Ship which has the Entire US Intelligence Community searching for it.. The Decision by the United States to Diplomatically support the efforts by Trade Unions, Churches and other Civil Groups was a pleasant suprise. Having all aspects of the American Intelligence Services and the Diplomatic Pressure on South Africa, Namibia,Mozambique and Angola not to let the Vessel Dock has been a source of support for this Coalition and has been a Major Diplomatic Defeat for both Zimbabwe and China. 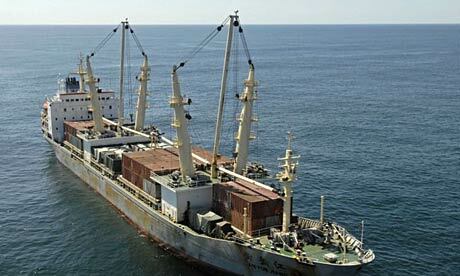 Nations that has been Heaping Support on Mugabe did an About Face and refused to let the Chinese Vessel dock. Why would the US take this opportunity to take such action? The Term of President Bush ends in Jan. 2009 and had been reluctant to take any major action on its on accord when it comes to Zimbabwe. Were there Chemical Agents on board the Chinese Ship? (aka Tear Gas and other Crowd Control Items) That is the $ 64 Question right now. It could be a reason for the rapid decision by the United States to prevent the ship from docking. This is a great decision by the President. www.iansa.org has a Google Map so you can track the Chinese Ship as it hides in the Southern African Region.